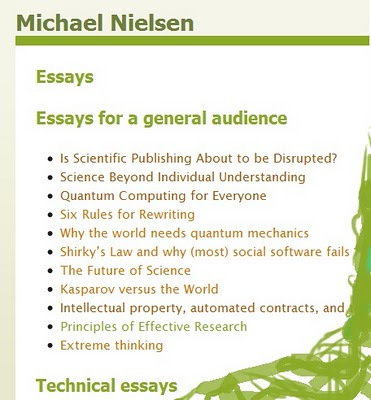 Michael Nielsen shares a lot. I'm going to re-read some of his essays soon. His general essays discuss the scientific method and the scientific enterprise. I used to have his popular technical book on Quantum Computation and Quantum Information, bought at Borders. He is great because it's easy for him to think outside the box about such issues as collaboration and incentive in science, where surprisingly many other genius-y people are stomped. How many professional innovators find it hard to innovate when it comes to their own accepted ways of doing things! The other day a Prof. I admire was talking about promotion criteria, journal rankings, and all that scientific village culture, and I said audibly to myself: but I don't care.